Set against an historical New England backdrop, Mombo brings some luxe to Portsmouth. : With only a few spots left for fine dining in downtown Portsmouth, Mombo is a must for special occasions, but it also offers more casual bar dining, too. Close attention is paid to seasonality, and local flavors are combined with a touch of historical context. 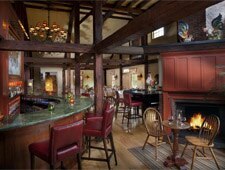 The elegant restaurant boasts Russian art and is situated by the Strawbery Banke Museum. Start with Rhode Island squid with house-made chorizo and sweet corn relish, or the wild Maine seafood pot with corn and red potatoes. A winter pumpkin-duck soup, followed with a trio of osso buco with venison, pork and lamb with foraged mushrooms and balsamic fig reduction, is a hearty meal on cold days. Gulf of Maine monkfish with fava bean risotto is another winter favorite. Many locals like to sit at the aforementioned bar in front of the kitchen to watch the action, or just stop in for desserts, such as the baked apple baklava with walnuts soaked in honey syrup. A well-curated wine-by-the-glass list and bottles from all over the globe guarantee you'll find more than one selection to complement the food.